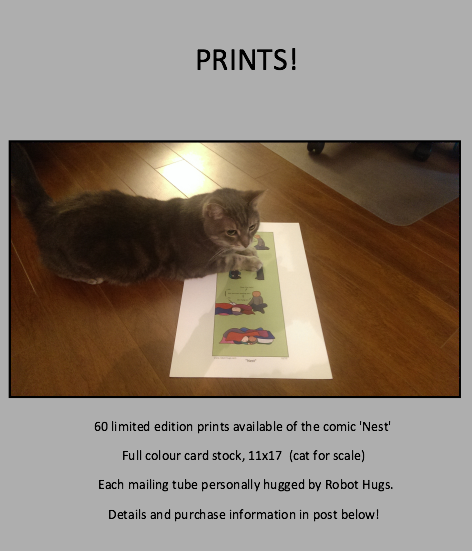 60 limited edition prints available of the comic 'Nest' Full colour card stock, 11x17 (cat for scale) Each mailing tube personally hugged by Robot Hugs. Details and purchase information in post below! Peoplefolk, I am so excited to finally announce that the print of the comic Nest is available for purchase. A closer look at the image, details, and ordering options can be found here. There’s only 60, so check it out while they last! I redrew this print naked. Does that help? I think so!